In summer 2000 I was at the Spiritual Frontiers Foundation International, giving a speech entitled "How the Money Works in Organized Crime" about narcotics trafficking, etc. etc. The Department of Justice says that we -- Americans -- launder $500 billion to a trillion dollars a year. I asked the audience, "What would happen if America stopped being the world wide leader in global money laundering?" A hundred people (who go into the woods for three days once a year to help work on evolving our society spiritually) said that the stock market would go down & we would have trouble financing the government deficit & so our taxes would have to go up or our government checks might stop, because the $500 billion to a trillion would go to Switzerland and Singapore instead of here. "Okay," I said, "imagine a big red button up here on the lectern. If you push this button, you can stop all hard narcotics trafficking in your neighborhood, your city, town, county, state & your country tomorrow. Who'll push the button?" Out of 100 people dedicated to evolving our society spiritually, guess how many would push the button? One! I asked the other 99, "Why would you not push the button?" They said, "We don't want our mutual funds to go down, & we don't want our government checks to stop, & we don't want our taxes to go up." Right then the CIA & Department of Justice had full "democratic" authority & popular support to facilitate narcotics trafficking. Those of us who have a long term view of planetary health sometimes lull ourselves into believing that the average citizen is compelled to do the right thing. A simple Google search -- and some critical thought -- reveals millions of interesting tidbits on topics that are critical to the health of the planet. What we fail to realize is that there are only a limited number of citizens who have the inclination to pay attention. It does not take much observation to realize that those who are concerned frequent all of the networks, blogs, etc. that discuss and disseminate information on issues such as global warming, overpopulation, and other topics that we should all be discussing. Our primary task in shaping a more sustainable and sane society is not disseminating information, it is trying to identify why there is a lack of inclination amongst the general population to seek information. We are all products of our age and, in turn, act in ways that re-create that age. As an old joke goes, it is difficult to know what fish talk about, but you can be sure is is not water. It is difficult for any of us in "advanced" societies to overestimate the effects of the industrial age on how we see the world. This "water" -- our culturally embedded assumptions and habitual ways of operating -- comes back to haunt us when we try to fundamentally rethink and reinvent the industrial age institution we call school. In order to "escape" from the current paradigm, we have to move to a system that is about learning our entire lives -- lifelong education. We're going to need alot of "horsepower" for this move. And, if we are not attracting capital to a new paradigm, all we are doing is supporting the old one. I've designed an integral institution [see all posts from the last couple of months] that will enable us to live engaging, healthy lives with far fewer natural resources than are currently consumed. In order to comprehend the nature of the institution, one must acknowledge that not only do we need to restructure our "non-negotiable" lifestyle, we must do it to an extent even greater than most of us have contemplated thus far. While the authors go on to say that inquiry and reflection skills should be developed when we are young, I think that given our current predicament, we must develop this at all ages. Life's interdependencies tend to remain invisible to the fragmented academic theory of knowledge. Given this theory of knowledge, it comes as no surprise that the further an individual progresses in the formal system of education the narrower and narrower his or her knowledge becomes. Sometimes, I think that this industrial-age education makes it difficult for some readers to understand the content of this blog. I also think that this fragmented education and application contributes to our tendency to come home at the end of the work day and plop ourselves down in front of that most passive of mediums -- television. Learning is nature's expression of the search for development. It can be diverted or blocked, but it can't be prevented from occurring. The core educational task in our time is to evolve the institutions and practices that assist, not replace, that natural learning process. Over the past few years, I have come to realize that it will take an extremely comprehensive institution to reverse the destructive course that dominates today. Systems learning will play a key role in the design and operation of that comprehensive institution. They [the rishis] discovered that if they got rid of their usual distracting preoccupations, "the doors of the mind may be opened." What are some modern day preoccupations that keep our minds closed? I'm proposing that it is ists and isms. Someone like the Buddha would have been appalled at having an ist tacked on to their name. An ist implies a boundary as in I'm a Buddhist and you're not. Capitalist is another favorite of mine. What the hell is a Capitalist? A Socialist? A Communist? Once the ists and isms are applied, the learning stops for both those on the inside and the outside of the artificially imposed boundary. Our occupations themselves keep our minds closed. We are all specialists. It used to be that some of us had a room in our homes that was labeled a study. A place where our minds could range freely over a diverse set of subjects. No time for that anymore. We have replaced the study with home offices and media rooms. Neither format encourages the sort of learning that advances society. It is all about advancing our careers. Its seems to me that we did -- and/or we can -- make the time to advance society. But we have to be something other than a specialist to do so. Rather than turning -- churning might be a better description -- out individuals who are trained to sit behind a desk and be clever, our institutions of higher learning should be producing individuals who have a liberal arts foundation -- I know some will call me a liberalist -- and have mastered a craft, a trade, and/or an art. Let's do something meaningful with our lives. By doing so we may be able to cast aside the ists and isms that divide us. Entirely new ways of living are necessary, and if we don't adopt them voluntarily, we or our children will eventually adopt them involuntarily, and probably with great pain and difficulty in the process. We have a long way to go before we adopt these new ways of living. In some ways we are going backwards. Listen to this NPR piece on ethanol and bio-diesel. Who are you going to trust? The professor who will probably keep his job regardless of the results of his research and is paying his own way to share the results of his research? The professional, glib CEOs who will have to look for a new job if we are rational about the professor's research? The silly Seattle driver who apparently cannot imagine life without her car? Maybe we just like pain. If Harvard...is what it claims to be and its graduates are to be found everywhere, then why are they showing no signs of being able to deal with their society's terrifying problems. It's time for a new society. One that encourages an awareness of many stories. One that allows us to live a low impact lifestyle -- not just because we have to, but also because it is engaging and provides community. One that encourages life-long learning. No inflation. No usury. Compassion. Maybe most of all, one that encourages independent thinkers, rather than the zombies that are produced by the steady stream of distractions and delusions that define almost all media outlets today -- including NPR, with apologies to Daniel Schorr. Those who think that society can continue along its present course for the remainder of their lives are in for a big shock. We have got to create a system/institution that will enable us to learn and live lightly and master the art of living. [Thomas] Jefferson, founder and patron of the University of Virginia, never allowed his university to give degrees. He considered them pretentious, irrelevent to learning and unconnected to the preparation for responsibility. This wasn't idealism. It was the opinion of the most successful practitioner of reason. The purpose of universities has now been inverted. Learning has become a goal-oriented process aimed at winning a degree. The design and rules of the university/spa will attract those who are committed to life-long learning. All participants have the potential to be involved throughout their lives in the capacity of a student, a patron/student, and/or as a teacher. The goal would be for participants to master some art or science during their residency. In order to attempt to create a quality living environment for inhabitants of this planet, it is necessary to transcend the contemporary paradigm/system. It is extremely difficult to explain how to do this because the current paradigm is so engrained. Most of what is written about the state of our planet and plans to improve it is well-intentioned, but does not do enough to address the fact that we will have to live completely differently. Not just how we work and where we work. And how we gain consciousness and recycle and drive more efficient cars and live in walkable neighborhoods. All good, but not enough to overcome the overshoot situation we are in. Everything has to change radically. It will require a hyper-learning environment -- hence the reason for a new university. Allow me to expand on the concept that I attempt to explain above and in the posts leading up to the present. Maybe the most important concept to grasp is that in a resource-short -- and resourceful -- environment/system, the most revered people will be those who use daily only what they need for a quality life. 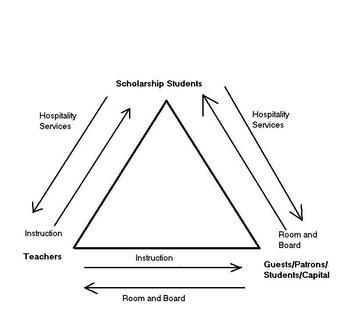 These are the working scholarship students and the teachers depicted on the above diagram. However, it is understood that some people would like to have a bit of a reserve -- something for a rainy day. These savers and/or those who have benefitted by the rules of the contemporary paradigm (the your money can "work" for you paradigm, the investment paradigm) need a place to store their wealth. Hence, the patrons/students/guests/capital participants in the new paradigm. (See diagram above) So, we create an environment that is more sustainable than the current sprawl/consumption model. One that is extremely attractive. Scholarship students and teachers get room and board in exchange for working 2-4 hours per day. As has been noted elsewhere, this is the amount of time committed for work in "older cultures" and it is the amount of work time that futurists, as little as four decades ago, thought would be a reality today as the result of productivity gains. The spa lifestyle is extremely attractive and the new university is necessary. As they say, necessity is the mother of invention. A match made in Consciousness. We are desperately seeking something. Witness the increased number of people who are attending evangelical and/or fundamentalist churches. While one can understand the desire for community, we may be regressing in our psychological development as we choose to toss aside critical thinking in this quest for community. Another disturbing element -- likely correlated -- is the decline of critical thought in our institutions of higher learning. Stanley Aronowitz makes a compelling case for creating "true higher learning" in The Knowledge Factory. Maybe, it's time to establish a community of critical thought and develop an institution of higher learning at the same time. In some respects it could resemble the life of Trappist monks -- makers of Chimay beer and other products. A recent article in Ascent Magazine discusses their commitment to "elevating their work to the level of prayer -- a concept some of us may know as Seva, or Karma Yoga." Most of us admire their dedication to a spiritual life and a quality product, but we can't see ourselves in the lifestyle. Instead of making beer, a new order of critical thinkers could provide education -- and design, build and operate ecologically-sensitive spas that permit guests/members to escape the pollution of society. It would be a wonderful way to live. As stated in prior posts, one-half of the available space at each spa would be dedicated to students/teachers and one-half would be dedicated to those who are guests/members. While those in the new order would not have to take a vow of poverty, they would be living lightly -- and fully -- on the land while in residence. To me, it is this fullness/richness of life that is sought by those who may be gaining community at the cost of critical thought. By all accounts, we are becoming creatures of specialization -- can you say Australopithecus. Survival of our species likely will require the return of the generalist.